NOTE: As I write this, out my window here in New York snow is dumping onto the streets and the thermometer only shows 40 degrees. Last Friday it was sunny and in the fifties. About twenty minutes ago, I was in my running shorts, about to head out for a jog. The weather is having a schizophrenic fit. This past weekend, Dave and I grabbed a discount fare for a some diving in Grand Turk. Three years ago, Dave had visited and dove at Grand Turk, one of the Turks and Caicos Islands, north of Haiti and the Dominican Republic. The first thing a New Yorker notices upon landing in Grand Turk is the languor. People stand around, leaning against walls or sitting on the ground, and it seems as if they're all waiting for something to happen, though they're in no particular hurry either way. In New York, even the panhandlers are aggressive and in a hurry. If all the cities of the world were grouped at the start line at one point, New York sprinted off and has never stopped, while Grand Turk jogged a few stops, then strolled to the side of the track to lie down in the grass to watch the clouds floating by. On Sunday morning we set our watches ahead an hour, but by the time the trip ended, my watch was probably five or six hours behind. Perhaps the laid-back pace of life arises from the metronomic refrain of the surf lapping at the shore. It is set for all of time at a soothing largo, and at night it would soothe me into slumber. The perfect weather this time of year didn't hurt. With the sunshine and a light breeze of warmed spring air, no one's in a hurry to get indoors. Wherever you are, that's a good place to be. The people of Grand Turk, many of them Haitians, also prize spontaneity and a live-in-the-moment attitude over certainty and planning. The next day's schedule at the dive shop seemed to change from moment to moment, and ask a question twice and you're likely to receive a different answer each time. At restaurants, inevitably the first thing I ordered would be unavailable. Dave and I tried to order lobster quesadillas at one restaurant as they were listed on the chalkboard as that day's special. The waitress said they didn't have any lobster. When we pointed out the board, she glanced over and said, "Hmm." Every day, for breakfast, I tried to order the crab and avocado wrap, listed as a specialty. Each day, I was told that avocado would come in the next day, but it never did. The only time I'd been diving before was in 2003, when I got certified on the Great Barrier Reef. I dove there and in the Galapagos, but hadn't touched thought about diving at all in the years since. I couldn't even find my PADI certification cards for this trip, but fortunately the dive shop was able to look up my info so that I could rent tanks. Dave, on the other hand, has been on some 90 odd dives, and he also owned all his own equipment. On Sunday morning I took a quick refresher course, relearning how to set up my equipment, handle basic emergency situations underwater, and control my buoyancy. Then I joined Dave and a couple from California for our first dive, at Finnbar's Reef. 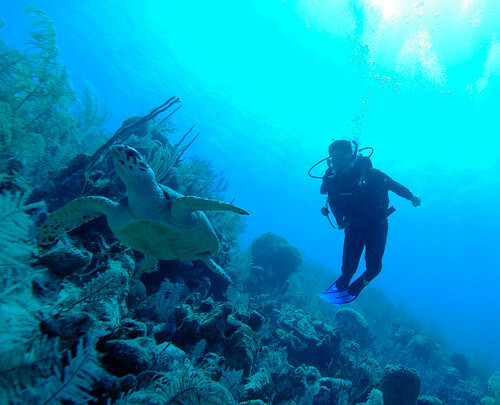 One of the attractions of diving at Grand Turk is how close the reef and ocean floor wall are to the shore. A five minute boat ride and we were there. I'm not a huge fan of living aboard a boat or taking long, choppy rides out to a dive site. 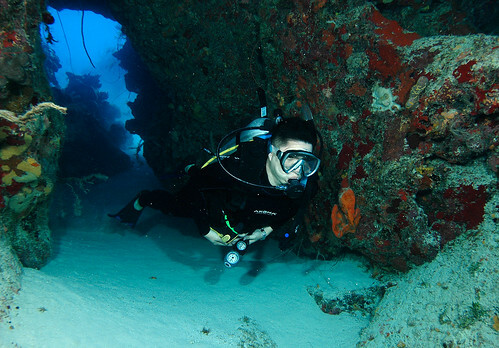 Diving, like spelunking, has a strong mental component. I'm no yogi, but putting in the regulator and dropping into the ocean feels to me like entering a meditative state. If your mind doesn't want to go to that calm place, your body won't follow. It's not a sport for the easily panicked. My first open water dive ever, on the Great Barrier Reef, was in really choppy waters, on a rainy day. We jumped in and all grabbed hold of a rope, leaving our snorkels in while waiting for our classmates. The waves kept crashing into us, and when one particularly dense wave hit, the woman next to me, a jittery middle-aged Londoner, suddenly lost her grip on the rope. In her panic, she grabbed onto me and pulled me down into the water. I immediately choked down a mouthful or two of ocean water. Her hands were all over me, tugging at my hair, mask, BCD, snorkel. My mask came off and I couldn't see. I gave her a light shove to free myself, then tried to get my mask back on. The waves kept pounding me, and I kept swallowing water. In a second between waves, I spotted the rope, too far away now for me to reach. At that moment, I decided I couldn't wait any longer and just put my regulator in, cleared some air out of my BCD, and dropped into the ocean. With salt water in my mask, I couldn't see much. My heart rate was high, my breathing quick and shallow, and my first few breaths drew nothing. They'd taught us this in class, that you had to breathe slow and deep to pull oxygen out of the tank. I closed my eyes, let my body relax, and drew in the longest breath I could, then exhaled as slowly as possible. And again. And again. And finally, the air came, and I could hear my heartbeat slowing. As I sank down, one foot after another, the water around me grew still. Once I felt in control again, I cleared my mask and swam back to the rope. My first time out, and perhaps my most valuable real world dive experience. In Grand Turk, I was reminded of the lesson twice. Once, Dave dropped down a few feet, then ascended again. I asked him after the dive what had happened, and he told me that he didn't feel completely right upon entering the water, so he popped back up to straighten his head out. 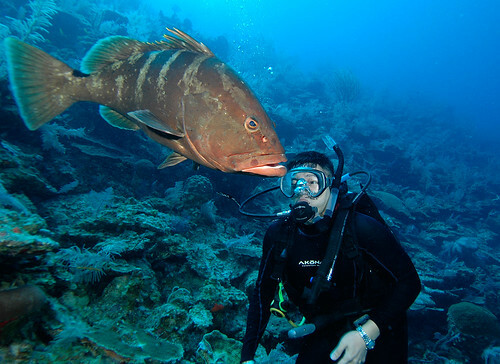 Another time, our divemaster Mackie couldn't clear his ears, so he ascended almost as soon as he'd hit the ocean floor. It took an ascent all the way to the surface before his ears cleared. Experienced divers know it's better to straighten yourself out at the surface then to try and do it down at the ocean floor. Almost immediately after dropping down to the reef at Finnbars, we encountered a sea turtle feeding. As we flocked around to watch it, I heard a metallic tapping. Our divemaster Mackie (a spitting image of Dusty Baker, but with a Haitian accent) was tapping his tank and pointing into another nook in the reef wall. I swam over to find another sea turtle, even larger than the first. Later we spotted a lobster hiding in a dark nook. On the next dive, at Aquarium, I found a half dozen or so barracuda waiting for me at the anchor line. The water in Grand Turk was a dazzling aquamarine, with glass-like visibility. That's me, checking out a sea turtle. 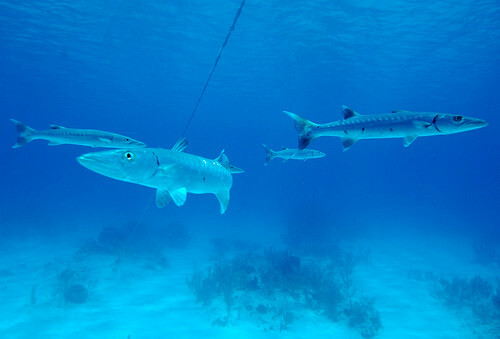 Heading back to the line for our decompression stop, Dave and I met up with a group of barracuda. The next day, we dove twice in the morning. Our first dive was at a site called Tunnels for its two swim-throughs. It was my first time navigating through a tunnel, and it was amusing, like playing in an underwater playground. Me, popping out of a tunnel. Our final dive was at Coral Gardens. On the boat ride out, Emanuel told us to prepare to meet one of Grand Turk's local celebrities. As soon as we swam over the edge of the wall, he popped up to greet us. He turned out to be Alexander, a friendly grouper. We were able to pet him, hold our hands over his mouth, and cradle him like a puppy. Dave even pulled out his regulator to give him a smooch. Dave pulled out his reg to give Alexander a smooch. Up on top of the wall, another grouper named Pretty Boy had staked out his plot. Grouper are territorial by nature, and Pretty Boy had chased Alexander down off the shelf. We spent a good amount of time playing around with Alexander, and without realizing it, he pulled us further and further down the wall. Emanuel finally flashed the signal for us to ascend a bit. I looked at my computer and saw that we were down at 120 feet. Before our decompression stop, Dave pointed at what appeared to be some dark fern arms poking out of the sand. I shrugged. He tried to think of how to explain what he meant, then went down to the sand and wrote EELS. I looked again and realized he was right. The short, dark strands poking out of the sand were tiny eels. We wanted to do an afternoon dive, but because we were flying out at 11:15 the next morning, Mackie and Emanuel advised against it. We might have a bit too much nitrogen in the system to fly so soon. Instead, we took the boat out around the southern tip of Grand Turk to Gibbs Cay. Along the way, we stopped to free dive for conch. They scuttled across the floor of the sea, sometimes disguised by the seaweed clinging to their shells. In a swimming pool, I don't ever have to clear my ears when diving down to ten feet or so. Here, diving down to 15 to 20 feet to grab conch felt like inflating my brain against my skull. The pressure in my ears and head were excruciating. The other issue was that I always had to shoot to the surface after grabbing a conch because I was out of air. We grabbed about six conch, just as much as we planned to eat, and headed on to Gibbs Cay. Mackie showed us how to clean a conch. First you punch a hole through the shell, near the wider end of the shell, on the opposite side of the opening. Then you use a knife to prod the conch out the other end, so that you can grab it and pull it out. Outside its shell, the conch is an alien looking creature, like a clam or mussel, but with a more complex shape. The conch has a sharp tooth or claw that it uses to drag itself along the sea floor. The part of the conch we ate was the white flesh, with the consistency of clam. We chopped that portion up and mixed it with diced tomatoes, habaneros, onions, and red peppers. We topped it off with fresh lime juice and a few drops of Tabasco and sealed it in a tupperware container to make conch ceviche. While we waited for the lime juice to work its magic, we waded into the water with some small fish to feed the local stingrays. They'd already been circling just off the shore in anticipation. 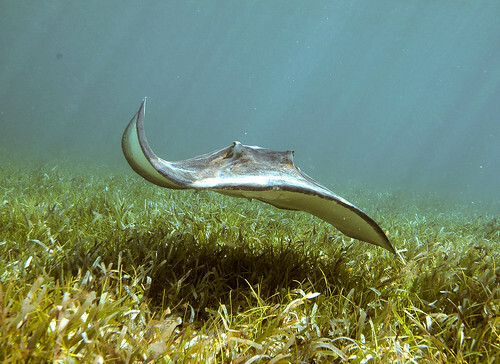 The touch of a ray's skin is a bit like liquid velvet. Dave and I weren't prepared for just how aggressive these rays were. We were flanked on all sides, and they hit us high and low. Rays are fairly docile creatures, but those eyes, mounted on top of its body and staring without emotion off to either side, are chilling. Seeing one come towards me was like being stalked by one of the tripods in War of the Worlds. A few times, I nearly lost a finger. How do stingrays see where to bite when their mouths are underneath their bodies and their eyes are above? Maybe they don't, as I learned. While underwater feeding one, I felt a sharp pain in my back. Another stingray had tried to climb over my back to steal the fish, and on its way over had taken a bite out of my back. I hadn't realized that stingrays had teeth, but now I did. Dave and Emanuel saw my back and seemed startled. The overzealous ray had left a fist-sized bloody hickey on my back. Later, after a few Presidente beers on the beach, our conch ceviche was ready. That was one tasty dish. While snacking, another visitor arrived, a lemon shark. We waded back in with our snorkels and masks for an underwater peek. For some reason, seeing sharks while diving or snorkeling never seems too dangerous, perhaps because they tend to keep their distance. 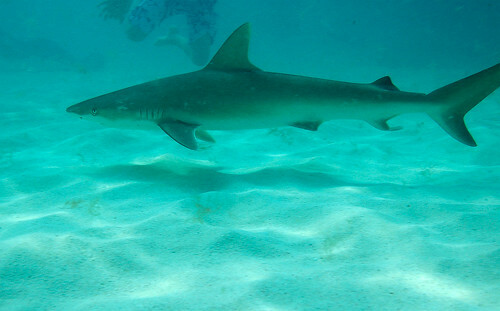 Of course, the only really dangerous shark I've seen underwater is a hammerhead in the Galapagos. If I saw a tiger shark or a great white, I'd pee my wetsuit. The only thing we missed out on were the humpback whales, who usually migrate through from late February through early April. They hadn't been spotted in the last few days, and since Dave and I were the only ones interested in going out, the dive shop felt it wasn't economically worthwhile to attempt a trip. I'd like to try and dive at least once a year from here on out. It would save me the trouble of relearning all my skills each time out. 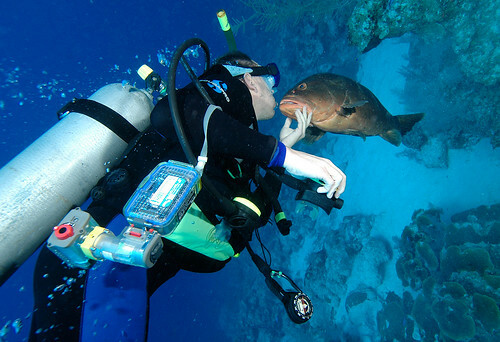 For you divers looking for a good dive site, Grand Turk is recommended. Wear sunscreen on your back, though, so you don't end up looking like a cooked lobster, like me. Dave also suggested diving at Bonaire, Curacao, and Thailand, all of which I'll have to try at some point. For our next dive trip, I'm not sure of where to go, but probably not South Africa. After seeing marine life up close and personal in the ocean, aquariums seem so dull.